So you like to walk your dog? Whatever the reason is, you’re getting in shape, you’re getting your pooch in shape, or you just enjoy the great outdoors, there are a few spots in and around Plymouth, MA best suited for your walk. Pet owners have hit the trifecta with these three awesome spots that will get pet owners and their four legged companions out of their walking routine rut! Personal experience has taught me that pet owners and their pets can become bored with the same old walk every day. So my beautiful dog, Jenna, and I started branching out, and oh the hidden treasures we’ve found! The Canal is a scenic stroll for you and your partner in crime to walk as much or as little as you like. It is an 8 mile stretch of paved pathway, with entrances about every 500 feet, that runs alongside the water. If you walk far enough you’ll hit Scusset Beach on the east end of the canal. It is a populated spot, during the summer you will be surrounded by the bustling of families visiting the cape, which means more love and attention from adoring fans for your dog! Even in the off season you are bound to run into a few others enjoying the path, because it’s a favorite of locals as well. So, if your dog is a social butterfly they will love all the people and pets there are to meet at the canal. The journey is not limited to walking either, this would be one of the better spots to visit if you and your dog are an athletic dynamic duo, it’s a great spot for a run as well! If you love the great outdoors and all that comes with it, from trees to cute woodland animals then this is the walk for you! This path is a beautiful 3.3 miles (6.6 miles round trip) of paved pathway winding through trees with views that would stun any Instagram follower, should you be so inclined to post a selfie with your four legged companion. It is a fairly quiet trail, you may run in to one or two people, so this may be a more appropriate spot for a dog who does not play well with others. I would say it is strictly a walking destination because it has some hills and tree roots that would trip up anybody running through the path. It is an especially nice walk during the summer when the sun is beating down and the temperature spikes because the trees provide you with some much needed shade. To get there, get off of exit five and drive about three miles down on your right will be the entrance to the Myles Standish State Forest. There is free parking right at the front and the hiking trail is clearly marked on the left side of the entrance. The PineHills is a housing complex complete with apartments, full size homes, and 55 plus accommodations. It has gorgeous grounds with professional landscaping kept up year round and a downtown area filled with businesses and people, really a great place to visit even if you are not a resident. The downtown area is a nice spot for a short stroll. However, their real gem is the walking trails which are available to everyone, even if you are not a Pinehills resident. Now here’s the kicker, there is even free parking, and plenty of it! Located behind Mama Mia’s restaurant. Ten miles of walking trails to explore and enjoy! This spot is conducive to dogs with a wide range of athletic skill. You can walk your English bulldog, who let’s face it would rather be napping, or get a good workout in and run with your energetic lab. 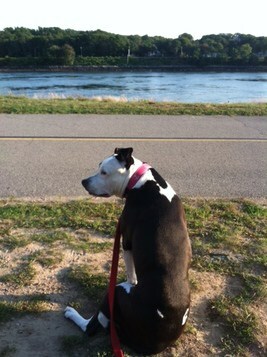 Stay tuned for new walking spots as my dog Jenna and I do some summer time exploration! Dog Park 101 is an important class you, as a parent, should to attend! Online classes are available! Ok, would you settle for a crash course? What I mean by this is that you need to know the “Etiquette” required when you bring Fido to a dog park. Yes, despite the fact that you’re in a park, you still need to pick up after your pooch. Your common courtesy will help to keep the park clean, avoid the spread of disease and others stepping in your dog’s mess! If your dog is a bully then he shouldn’t be at the park. If you haven’t mastered the training techniques yet, please do so prior to unleashing your dog onto the public. Others bring their pets there to have fun, not to be picked on by your dog. While the sounds of happy barking can be music to our ears, keep in mind aggressive barking or intimidated barking is unacceptable. It can cause other dogs to become stressed and defensive if your pooch is being aggressive or barking at their owner. That can cause all sorts of unpleasant chain reactions. Again, the basic rule for dogs coming to a park are “training required”. Your pet should respond to commands such as “Come” “Stay” and “No” and not just under calm circumstances. Your pet should follow commands even during times of stress. You must have total control of your pet before you not only release them into a place with other dogs and humans, but for their safety as well. 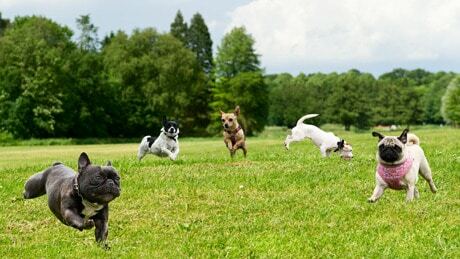 While it‘s great for you to connect and socialize with other pet owners, it’s not ok for you to turn your back and not pay attention to what’s happening with your dog. Again, things can escalate to a dangerous situation pretty quickly. You can socialize and keep an eye on your dog at the same time! Try to stay off your smart phone too. It’s irresponsible if you don’t keep close tabs on your dog at the dog park. You’re trying to make friends – not enemies! Take a few moments before you bring Fido to a park and search the net for Park Etiquette rules. The above are simply a few of the very important rules to get you started; however there are many more that you should familiarize yourself with. Remember, a trip to the park should be a fun outing for you and your pet! Follow some common rules of etiquette and it can be fun for all involved.